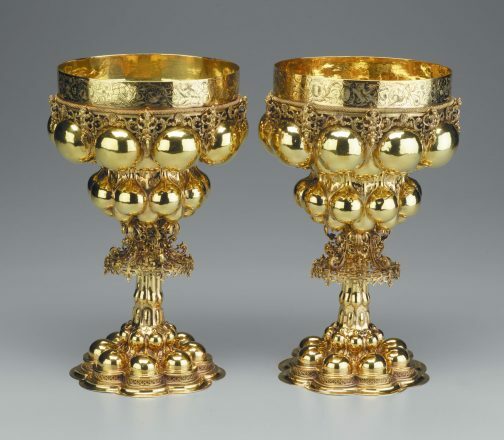 This pair of cups crafted by Nuremburg goldsmith Hans Petzolt in 1596 was the impetus for author Simon Goodman’s talk at the DIA. 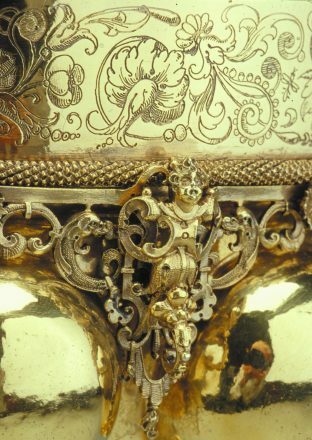 With these cups, Petzolt translated a late Gothic-era design into new Renaissance splendor overflowing with rich details. A Tale of Two Cups -Stories of stolen art, the Holocaust — and a Detroit twist — will be told at a JCC Book Fair event. In 1596, Hans Petzolt, a Nuremberg goldsmith, created two silver-gilt cups adorned with intricate swirls, scrolls and portraits. Kalman “Carl” Mayer von Rothschild (1743-1812) of Frankfurt am Maim, one of 10 children and the man who established the Rothschild banking branch in Naples. Carl is the first-known owner of the cups after Petzolt. Eugen Gutmann (1840-1925), who purchased the cups from the Rothschild estate. Gutmann was an art collector and businessman who developed the Dresdner Bank into one of Germany’s leading financial institutions. Fritz Gutmann (1886-1944) of Holland was Eugen’s son. Fritz managed Dresdner’s London office and inherited the cups from his father. Karl Haberstock (1878-1956), a Berlin art dealer and member of the Degenerate Art Disposal Commission. During WWII, the commission looted private collections, with choice works kept for Hitler’s top henchmen and “unworthy” items destroyed or resold to support Nazi Germany. In 1942, Haberstock “purchased” artwork, including the Petzolt cups, from Fritz, who was later murdered in Theresienstadt. Hermann Goering (1893-1946), head of the Luftwaffe, the German air force, who received the cups from Haberstock. Members of the U.S. Army, who confiscated Goering’s extensive art collection when they raided his Bavarian hideaway in 1945. The question was, to whom did all the art — including the cups — actually belong? Gail Fisher has never held the Petzolt cups, but last year she picked up a book called The Orpheus Clock (Scribner) that tells the history of the Gutmann family art collection, seized by the Nazis. The book included a revelation: The cups are now legally owned by the Detroit Institute of Arts. How that came to be is yet another surprising aspect of this story. As part of the Jewish Community Center of Metropolitan Detroit’s 66th Annual Jewish Book Fair (which officially runs Nov. 2-12), and co-sponsored by the Holocaust Memorial Center Zekelman Family Campus, the DIA will host a talk by Simon Goodman, Eugen Guttman’s great-grandson and author of The Orpheus Clock: The Search for My Family’s Art Treasures Stolen by the Nazis on Sunday, Oct. 15. 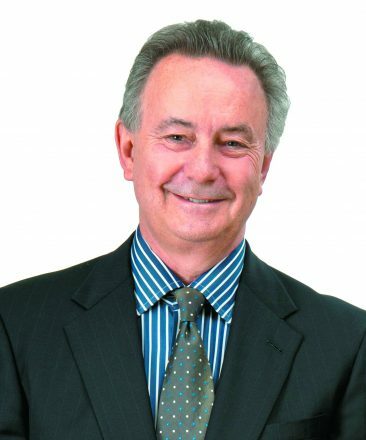 Goodman will be followed by Salvador Salort-Pons, DIA director, who will speak on museums and the provenance of looted art. 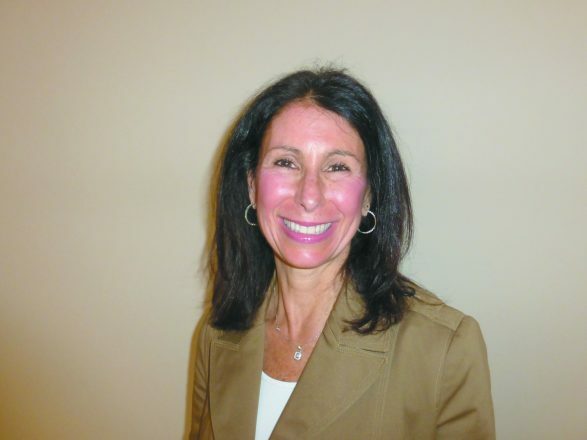 Fisher of West Bloomfield is past chair of the JCC Book Fair and a docent at the DIA and the Holocaust Memorial Center. An avid reader of books about the Holocaust, Fisher began The Orpheus Clock (the title refers to another object once part of the Gutmann collection) late at night, and she did not put it down until she was done. Fisher immediately wrote the DIA. She contacted staff at the Holocaust Memorial Center. She spoke with fellow Book Fair committee members. Between the Detroit connection and the compelling question of what to do with looted art, everyone agreed to sign on as a co-sponsor for a program. But Fisher also describes The Orpheus Clock’s cast of characters — from the gracious Simon Goodman, still in search of much of his family’s stolen collection, to Rose Valland, a member of the French Resistance who played an invaluable role saving Jewish-owned art — as irresistible, resulting in a true story of dedication, detection and surprise. 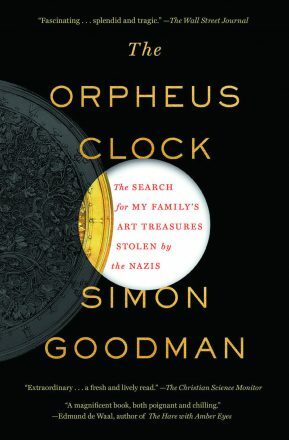 Simon Goodman, author of The Orpheus Clock, will speak at 1:30 p.m. Sunday, Oct. 15, at the DIA, followed by DIA director Salvador Salort-Pons. There is no charge for the event, which will include a dessert reception, author book signing and gallery tours, but advance registration is required. (313) 833-4005; dia.org/orpheus.